A woman's lips swelled up so much post getting lip fillers that her lips almost touched her nose! Rachael Knappier, from Leicestershire, said she "shouted out in pain" after she was given the lip filler treatment by a beautician at her friend's house. The 29-year-old got filler injections at a friend's house by a beautician who had noticed a small bump on one side of her lip. The beautician told Rachael that the bump could be 'evened out' by injecting the opposite side of her lip with filler. Agreeing to it, she went ahead with the filler. Rachael said she experienced a sharp pain in the top of her lip but was told that this was perfectly normal. 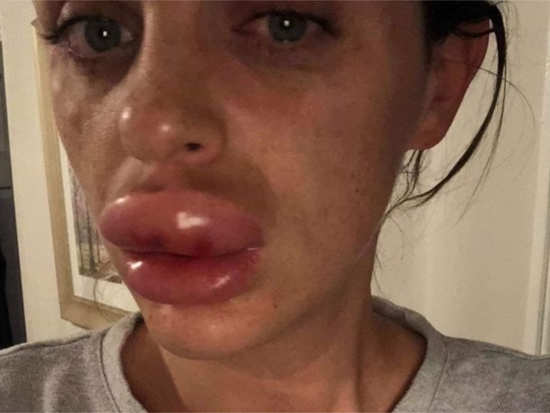 At 2 am, Rachel woke up to find that her lips had swollen terribly and when she asked her beautician friend as to why this happened, she was told that she was having an allergic reaction, urging her to take anti-histamine and get to A&E. After seeing a local aesthetic nurse, Rachael was told that the filler injection had led to necrosis, which had begun to destroy the soft tissue of her lip. Her only option was to visit a private clinic in London and her lips returned to normal after a few days. Post the disaster, Rachael was told that the major swelling on her lips had probably been caused because the filler had been injected close to an artery or vein, leading to a vascular occlusion, when the blood flow to an area of the body is reduced or stopped completely. She now want to warn people against getting fillers by people who are not medically trained. “Don't go to a beautician would be my advice. But equally, do your research, check it out for yourself, ask the questions. They will give you the answers if you ask them and if they don't then there's your warning sign. But make sure that they are medically trained to treat you if something goes wrong,” Rachel said. She has even started a petition against this and has collected close to 1800 signatures. 3High blood pressure: Can tooth loss in older women lead to hypertension? 4Can depression be treated by stimulating one brain area? 7Is alcohol the solution to weight loss in adults with diabetes?